To create (deploy) a virtual machine (VM) and set its initial configuration, you use the Add Virtual Machine wizard in the VDC Control Centre. Most aspects of the VM configuration can be modified later. This document describes using a template as the basis for VM deployment. For the alternative of using a 'bootable ISO', see How to create a VM by booting from an ISO. 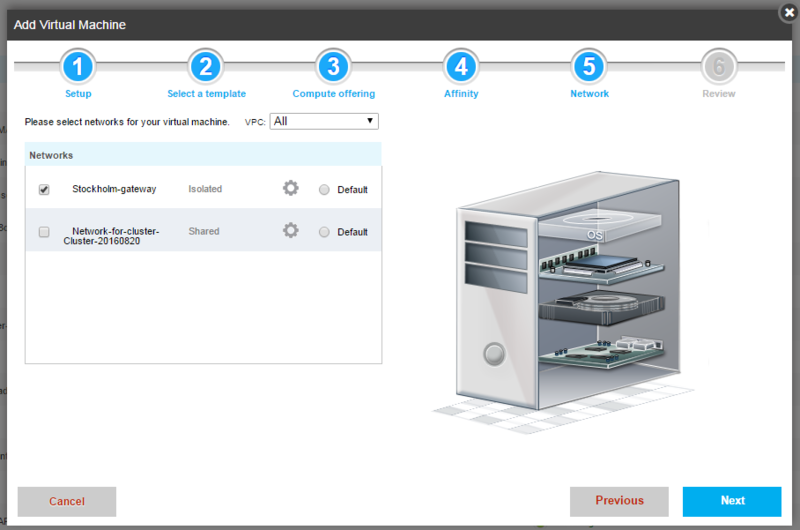 To create a virtual machine, login to the VDC Control Centre and click Virtual Machines in the left-hand menu. Then click the Add Virtual Machine button at the top right. The Add Virtual Machine wizard leads you through the creation procedure in steps. A visual progress indicator is displayed in the form of a picture of a physical desktop PC case into which the hardware and operating system components are slotted as you progress. You can use the Next and Previous buttons to move through the steps and make changes before you are finished. The VDC zone and hypervisor where the VM will run. The ‘compute offering’: the number of CPUs and the internal RAM memory. The affinity groups to which the VM will belong (optional). The network(s) to be connected to the VM. You must have at least one network in place in a zone before starting to create a VM. New VDC user accounts are provided with a default 'Local with Internet Gateway' network in each Zone. Note that you do not specify the size or performance of the VM root disk. The root disk will be deployed using SSD physical media, and its size is determined by the virtual machine template. Standard root disk size for Linux-based templates is 10 GB, and 60 GB for Windows-based templates (some Windows templates are available with choice of 60 GB or 100 GB root disks). The size of a deployed virtual machine root disk can be increased at any time (but not decreased), so long as a virtual machine is stopped. Root disk size can be user-set at deployment by creating a new template, based on a snapshot of a running VM, with the desired root disk size. See How to create a template from a volume snapshot. 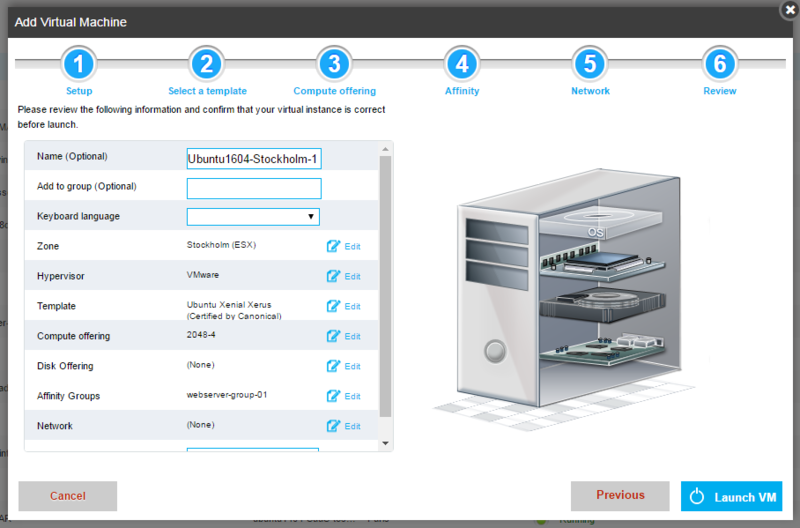 Select the desired zone and hypervisor from the drop-down list. 'ESX' means the VMWare ESXi hypervisor. Template is already selected as the basis for the virtual machine. Select the template you wish to use as the basis for the virtual machine. For the templates provided by Interoute in the Featured tab: First you select the type of operating system (Microsoft Windows Server, Ubuntu Linux, CentOS Linux, etc. 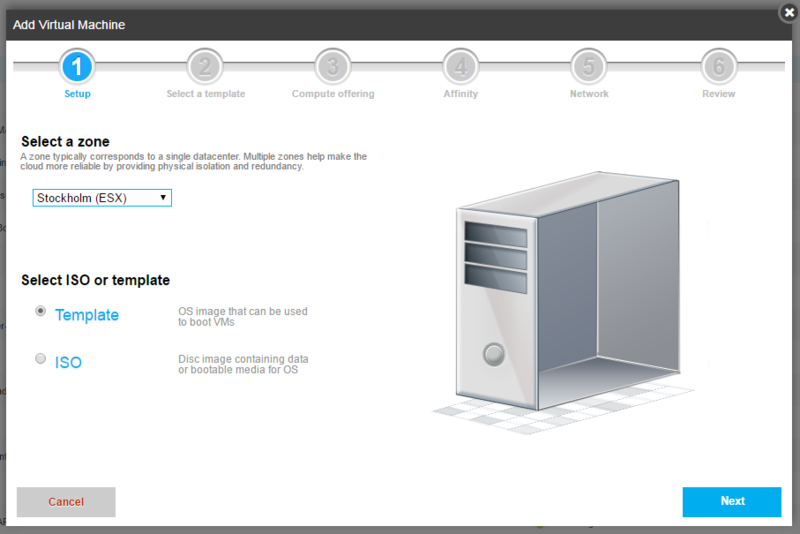 ), and second you select the particular version (such as Ubuntu Certified 16.04). To finish the selection you must tick the box at the bottom to accept the terms and conditions applicable to the deployment of that template. Alternatively, you can select from templates that you have created or uploaded yourself, in the My templates tab. Use the sliders to select the desired amount of RAM (in Gigabytes) and the number of CPUs for the VM. Note that these are independent choices, there are no restrictions on the CPU/RAM combinations available. You can modify these settings at any time for a stopped VM. For some templates, it is possible to do 'hot scaling' on a running VM (see the VDC 2.0 Data Sheet: Vertical scaling of virtual machines). As an option, if you have any affinity groups defined they will be displayed here and one or more can be selected. See How to use affinity groups to create resilient VM solutions. The Networks list will show the existing networks in the zone that you may use. The network marked Default must be used, and others can be added. To change which is the Default network, click the appropriate radio button. Specify the local IP address for the VM: If you click the cog wheel button for a network then you can specify the local IP address for the VM in the network (otherwise it will be chosen randomly from the unassigned addresses). You will need to know the CIDR address range for the selected network: to find it, you need to click Network on the left-hand menu and look for the CIDR range next to the network name. But note you cannot do this while the Add Virtual Machine dialog is active. 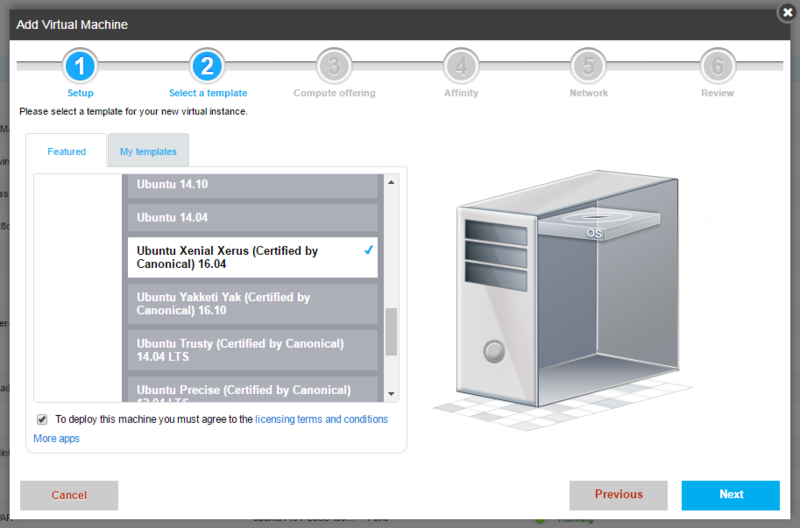 The VM configuration that you have entered is shown for you to review. To make changes, the Edit links will take you directly to the indicated step. Or use the Previous and Next buttons to move through the different steps. A Name for the VM is optional but recommended (otherwise the name will contain the VM's UUID). When you are ready, click the Launch VM button. 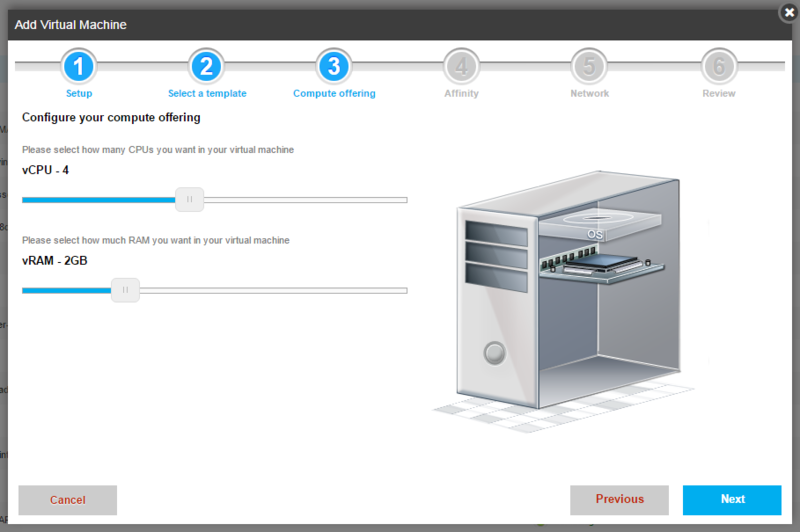 The setup dialog will close and the name of the new VM will appear in your virtual machines list. In the 'State' column of the list you will see an indicator of the VM being in state 'Starting'. If you are creating a VM on a new or empty network, it may take slightly longer for the VM to deploy because a virtual router has to be created for the network services. You may need to refresh your view of the Control Centre to see the current VM status: that is, click to any different panel, then re-click the Virtual Machines button. Once the VM deployment has completed, the State will show 'Running' with a green indicator dot. Your 'Running' and 'Total VMs' numbers in the Dashboard will also be updated.